Myofascial pain shows up in all sorts of different ways: you could have lost some flexibility after an injury, noticed painful “knots” in your muscles that are restricting your movement or have ongoing pain in your legs, shoulder, hips or back. Maybe you’ve tried other treatments with little or no success. Myofascial release therapy could be the answer to your chronic pain. To understand the solution (myofascial release), you have to first understand the problem (myofascial pain syndrome). 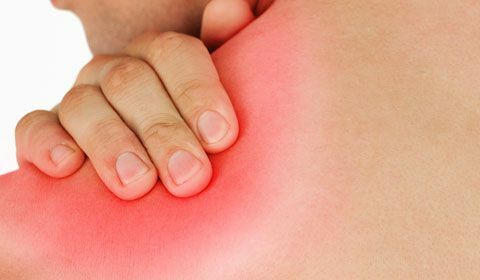 Myofascial pain syndrome is a chronic pain disorder caused by sensitivity and tightness in the myofascial tissues, comprised of muscle (“myo” meaning muscle) and fascia. Fascia is the thin connective tissue that runs all over your body, creating an uninterrupted web that supports your bones, organs, nerves and blood vessels, along with all your muscles. It absorbs shock and helps your muscles move as part of the myofascial system. As a result, it can accumulate trauma from sudden injuries, damaging repetitive movements and chronic conditions. Restrictions in the myofascial tissues can often be traced to specific points on the body, known as “trigger points,” which can cause pain in other parts of the body, even parts that don’t seem directly connected. This is known as referred pain. Myofascial pain syndrome is more than just muscle discomfort, which everyone experiences from time to time. The discomfort of myofascial pain syndrome will continue to bother you or even get worse, long after the known cause has passed. Myofascial release therapy is a therapeutic approach that can be used to treat myofascial pain syndrome. It’s a hands-on technique that works to relax, lengthen and realign your fascia. The goal is to bring you pain relief, as well as give you back your full range of motion. A trained physiotherapist or chiropractor will do a full, hands-on assessment of your muscles and movement. Healthy fascia should feel malleable and elastic, whereas areas that are holding trauma and tension will feel stiff and tight. These are your trigger points, and could be the origin of your pain. Remember, these aren’t always the same points as where you feel the pain, since you could be experiencing referred pain from another part of the body. Using light, manual pressure, your therapist will massage and stretch the trigger point, sometimes holding that point for a few minutes. Your therapist may repeat this process a few times on each trigger point they find, until they feel a full release. There are two main types of trigger points: primary and secondary (or satellite). If a primary trigger point develops in one muscle, it can restrict the muscle’s proper movement. Left untreated, other muscles might compensate as your body finds new ways to move around the first injury. This compensation can result in a secondary or satellite trigger point in the new muscle(s) being used. To locate a trigger point, try rubbing the area where you’re experiencing pain to see if you can feel a “knot” or “rope.” You may have to massage a tight muscle first to feel the trigger point. If you press on that point of tension and the pain radiates outward, it could be a trigger point. The difference between primary and secondary trigger points is difficult to assess without specialized training in this area. It’s possible to find your own trigger points at home, but it can be tricky. The trigger point could be hidden in a muscle that’s too rigid or behind a bone or larger muscle, making it difficult to locate and release on your own. Working with a trained physiotherapist or chiropractor who knows the patterns and connections of these trigger points is often the best way to find and treat myofascial pain. A foam roller is a tool that people can use at home to get relief for mild myofascial pain. It looks like a rolled up yoga mat, can be smooth or marked with ridges, and is made of firm neoprene foam. The foam roller is rolled back and forth underneath the muscles to locate areas of soreness. Once located, you simply use your body’s own weight to hold pressure to the tender area for 30-60 seconds. Repeat as necessary. Myofascial release therapy is not the same as massage therapy. First of all, they each have a different focus. Massage works with soft tissue and the overall system of muscles in the body to relieve stress and tension. Myofascial release works specifically with the connective tissue (fascia) to relieve the tightness that causes muscle restrictions. Secondly, the type of touch involved in each technique is different. Massage therapy involves steady movement, like kneading and stroking, on the muscles to bring relief; myofascial release uses sustained pressure to stretch and lengthen the fascia. Lastly, there is a difference in the use of lubricants. Massage therapy usually employs oils or lotions to help with smooth movement, whereas myofascial release therapy doesn’t need a lubricant. Not sure what’s The Difference Between Myofascial Release & Massage Therapy?